I look forward to welcoming you to DISTAS 2018. The DISTAS 2018 Organising Committee is working hard on a programme that will give all participants a useful and meaningful learning experience. All Rotarians and incoming Rotary Club office bearers will benefit from the presentations and discussions over the weekend. And of course, we will all enjoy the great fellowship that makes Rotary so special. Greetings from the Rotary Club of Pontian & Rotary Club of Singapore West! 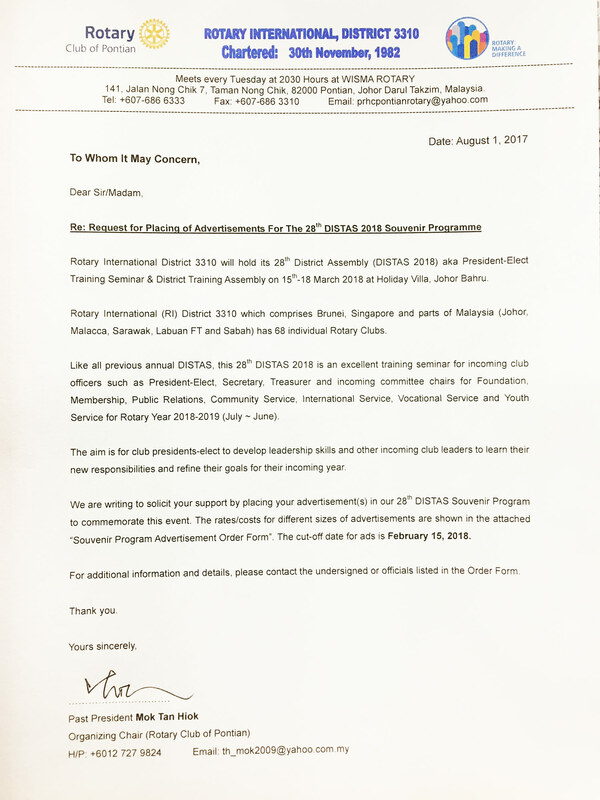 The District 3310 will hold its 28th DISTAS aka President-Elect Training Seminar & District Training Assembly on 15th~18th March, 2018 at Holiday Villa, Johor Bahru. We have negotiated with Holiday Villa Hotel and obtained further discounts for Single & Double/Twin occupancy from RM255 and RM285 to RM235 and RM255 respectively. Registrants have to make separate bookings for their own accommodations by using the ROOM RESERVATION FORM. We are looking forward to meeting you all at DISTAS 2018! 14th, 15th &16th March 2018, 10.00am & 1.00pm. Departure from Holiday Villa JBCC to Senai International Airport on Sunday, 18th March 2018: 1.30pm, 3.00pm & 5.00pm. Participants traveling from East Malaysia required the above airport transfers are urged to urgently contact IPP Goh Hee Seng at +60-19-659 3912, giving your name, date of Arrival & Departure, flight number, ETA & ETD.